"I'm not to be trifled with!" 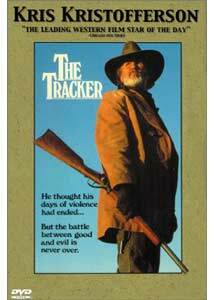 HBO produced The Tracker in 1988, starring Kris Kristofferson as Noble Adams, a Civil War veteran and retired tracker called into service to help collar "Red Jack" Stillwell (Scott Wilson), an escaped serial killer. Noble's son Tom (Mark Moses), fresh out of law school, joins the mission and learns about the harsh realities of life on the west as he and his father face rival bounty hunters and brutal violence. Kris Kristofferson's career was presumably still recovering from Heaven's Gate when this opportunity came along, and his craggy, bushy, steely-eyed screen persona seems right at home in the western milieu established by director John Guillermin. Unfortunately, Kristofferson is asked to carry the weight of a thoroughly predictable, cliché-ridden story that relies far too heavily on stereotypes and shopworn plot twists. Will Tom earn his father's respect? Will he rescue the young girl kidnapped by Stillwell's gang and earn the romantic favor of her older sister? Will Noble Adams succeed in tracking down his archenemy? Will there be any surprises in this story? Just one? Pretty please? Besides the paucity of imagination evident in the script, The Tracker relies too heavily on some uncomfortable stereotypes. "Red Jack" Stillwell is a crazed Mormon, seeking holy vengeance against Gentiles and Native Americans alike, with no apparent motivation beyond religious fanaticism and a driving urge to make his way from hostile Arizona to the "safe harbor" of Utah. Scott Wilson does what he can with the one-note character, but he's given little to work with beyond wild-eyed insanity and a willingness to kill on a whim. The film's Native American characters are not treated with much respect either, portrayed as overly trusting souls who readily fall prey to Stillwell's depradations. In the end, The Tracker fails because it sets its sights so low. It's an unambitious, uninventive little movie that meanders from beginning to end without striking so much as a spark of real energy. Western fans may appreciate the film's solemn respect for convention, but most viewers will find the action unexciting, the sentiments corny and the story uninvolving. Not recommended. Image Transfer Review: The Tracker is another example of HBO's recent tendency to crop their made-for-TV movies down to a widescreen 1.78:1 ratio for HDTV and anamorphic DVD release. In this case, the cropping isn't especially distracting or damaging to the film, and the western landscapes seem more at home in the wider frame, though other compositions seem awkward at times. The transfer is otherwise decent, generally soft and slightly smeary, with dirt flecks and hairs visible on the source print from time to time. Edge enhancement is minimal but present, and the low-budget, earth-tone film exhibits quite a bit of grain in a few scenes, though the digital transfer handles everything successfully. Not a great transfer, but not terrible either. Audio Transfer Review: The Tracker is presented in Dolby Digital 2.0 stereo format; ProLogic decoding places most dialogue squarely in the center, with occasional panning to one side or the other, but there's absolutely no matrixed surround content. The soundtrack is standard cable-movie material, with extremely compressed dynamic range, slightly muddy dialogue, and just a hint of low-end bass when music comes into play. Dialogue and sound effects are clear enough, and the digital transfer is competent, given the limitations of the source. Extras Review: Not much to look at here, just 12 picture-menu chapter stops and the standard cast/crew material covering cast members Kris Kristofferson, Scott Wilson, Mark Moses, and David Huddleston, as well as director John Guillermin and writer Kevin Jarre. The Tracker is a competent but uninspired made-for-cable western, watchable enough for fans of the genre but unlikely to win any new converts. HBO presents the film well enough on DVD; it just ain't nothin' special 'tall.